Hello beauties! Okay, so I am on a Cover Girl kick lately. Who knew I would be into so many Cover Girl products (one of my old standard makeup brands of early high school) after trying so many high end, sleek, or "new" brands! Well, I am continuing to be impressed with Cover Girl's "newer" offerings in their line! So, are you a potted gel liner fan? Do you love that look, but wish for a simpler application? I am a huge fan of potted gel liners, but I love the convenience of a pencil. Well, you get the best of both worlds with the lasted assortment of long-wearing gel-like liner pencils. I am planning a series of reviews of these type of "pencil-style gel liners" as many brands are making these now (in addition to Cover Girl). Including: Urban Decay, Milani, and Prestige. So, check back for those upcoming reviews! 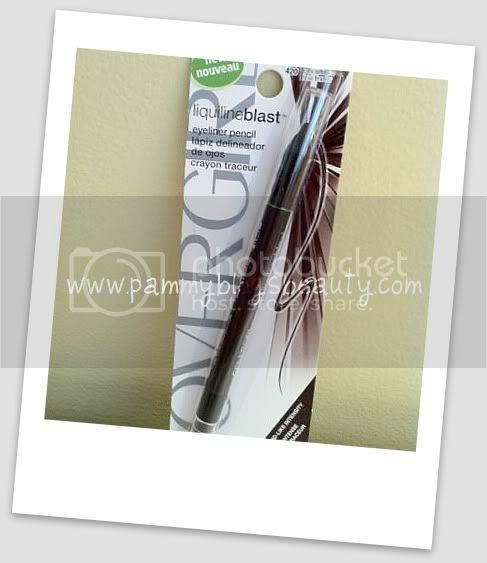 This review is for Cover Girl's Version: Liquiline Blast Eyeliner Pencil. For the review, swatches, and more photos please keep reading after the jump. I love these new Cover Girl liners! I swear, I have probably not purchased a Cover Girl Liner since I was in high school, but these have just intrigued me. Could they be a drugstore version of my beloved Urban Decay 24/7 liners (review on those coming soon!)? I just had to check these liners out, especially since I had a coupon! These are great affordable drugstore liners! At around $6 each, you are really getting a bargain (with coupons and sales, I purchased mine for less than $4 each, score!). I purchased these in Brown Blaze and Silver Spark. See the swatches above. I seem to be reaching for Silver Spark very often (especially when getting ready for work). Both of these soft and pretty shades compliment my fair coloring and blue eyes. Often regular black and brown liners look too "harsh" on me for everyday. These colors are soft and pretty and natural. They give a subtle definition to your eyes. The formula is "liquid/gel" like in texture. This liner literally just glides on your lid. It is "more liquid" than a potted gel liner yet not as "liquid" as a liquid liner. It truly is a happy-medium for texture. Unlike normal pencils, there is absolutely no tugging on the lid. As I continue to get older, I am trying to get more and more gentle when applying products to the delicate eyelid area. Note: If you want to blend/smudge, then smudge right away before color dries and sets. Application is seriously a breeze with the texture of this product. Completely effortless application!!! I love that there is a blending sponge on one end!!! I always smudge out my liner with a smudger brush, so it is nice to have one on the other end of this pencil! No digging for another brush. Just another element that makes the application quick, simple, and easy. I honestly wish all liners had smudgers on the other end! I love that it is an angled sponge tip as well! Shade assortment: The line carries approximately 6 shades: Violet Voltage, Silver Spark, Green Glow, Blackfire, Blue Boom, and Brown Blaze. So, you get not only the good basics like brown, grey, and black but also some "fun" colors like lime green, eggplant, and blue (the eggplant shade: Violet Voltage is the next on my "to get" list!). The wear: These wear pretty well for most of the day until. I do notice some slight fading by mid day, but for the most part, these liners stay on until I take them off. They are wet when you apply, but dry quickly and "set". Side note: I have dry skin, so I am not sure of the wear for people with oily lids. But, for me, I am generally pleased with the wear. So, as you can tell, I really like these easy to use and affordable liners! I find that I reach for them frequently when I am in a hurry and want a super-easy to apply liner. Also, these are great as they are so inexpensive and you can pick these up anywhere! I am really loving all the "newer" products that are coming out from Cover Girl. What pencil-style gel liners do you like? I would love to see what other brands offer! Thanks so much for reading!!! Thanks for the review. I, too, am really over the tugging on my eyelid with liners. lol! Wendy-I am always doing that to you! ;) The lime green one looks so pretty! Let me know how you like it!